How should national contributions be measured? The last days of March have seen the start of submissions of Intended Nationally Determined Contributions (INDCs) to the UNFCCC. The United States, Switzerland, European Union, Mexico and Russia have all met the requested deadline of the end of Q1 2015. As is expected and entirely in line with the UNFCC request, the INDCs focus on national emissions. After all, this is the way emissions management has always been handled and reported and there is no sign of anything changing in the future. As was to be expected, the United States submitted an INDC that indicated a 26-28% reduction in national emissions by 2025 relative to a baseline of 2005. This is an ambitious pledge, and highlights the changes underway in the US economy as it shifts towards more gas, backs out domestic use of coal, improves efficiency and installs renewable generation capacity. So far the USA national inventory indicates that the 2020 target is being progressively delivered, although it will be interesting to see whether this trend changes as a result of the sharp reduction in oil prices and a couple of summer driving seasons on the back of that. My own analysis in 2011 (see below) was that the USA would come close to its 2020 goal, but may struggle to meet it. The different overall level of emissions in the charts is the result of including various sources (e.g. agriculture) and gases, or not. 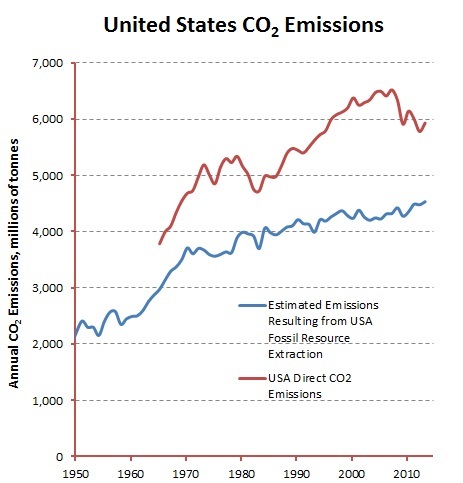 Direct emissions represent just one view of US emissions. Some would argue that the national inventory should also include embedded emissions within imported products, but this introduces considerable complexity into the estimation. Another representation of US emissions which is perhaps more relevant to the climate issue is the actual extraction of fossil carbon from US territory. As the climate issue follows a stock model, the development of global fossil resources and subsequent use over the ensuing years is a measure that is closer to the reality of the problem. The larger the resource base that is developed globally, the higher the eventual concentration of carbon dioxide that the atmosphere is likely to reach. This is because the long-term accumulation will tend towards the full release of developed fossil fuel reserves simply because the infrastructure exists to extract them and as such they will more than likely get used somewhere or at some time. This isn’t universally true, as the closure of some uneconomic coal mines in the USA is showing; or are they simply being mothballed? 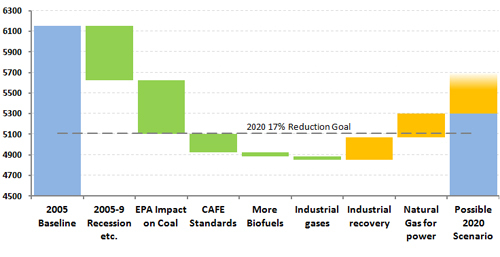 A look at US carbon commitment to the atmosphere from a production standpoint reveals a different emissions picture. Rather than seeing a drop in US emissions since 2005, the upward trend that has persisted for decades (albeit it a slower rate since the late 1960s) is continuing. 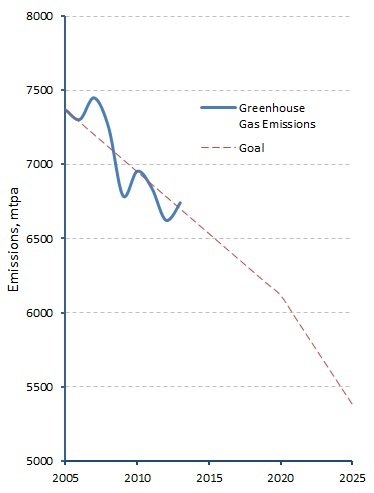 In the case of measured direct emissions, reduced coal use is driving down emissions. But for the extraction case, additional coal is now being exported and the modest drop in coal production is being more than countered by increasing oil and gas production. Total carbon extraction is rising. While there is no likelihood that national emission inventories will start being assessed on such a basis, it does nevertheless throw a different light onto the picture. 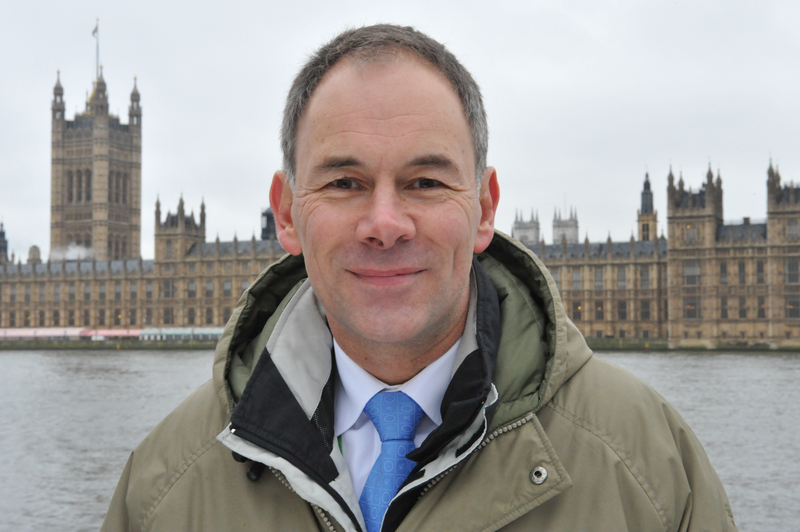 In a recent visit to Norway it was interesting to hear about national plans to head rapidly towards net-zero emissions, but for the country to maintain its status as an oil and gas exporter. This would be something of a contradiction if Norway was not such a strong advocate for the development of carbon capture and storage, a strategy which will hopefully encourage others to use this technology in the future. David, I realize you attempt to maintain a neutral and factual approach to this space … and I admire you for that. But, two statements above nail the problem on the head, and we need to seek alternative means to making actual reductions. 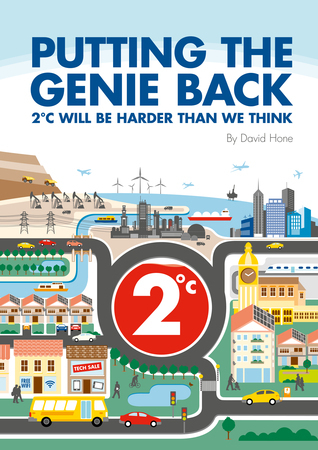 One sure way is to start retiring and dismantling carbon-based infrastructure at a rate consistent with the science as described by Dr. James Hansen et al (http://bit.ly/HansenPLOS) and the German Advisory Council on Global Change (http://bit.ly/WBGU-2009). They both have time frames to zero carbon of less than two decades. Such a strategy would create an effective ‘de facto’ carbon fee which our governments seem unlikely to deliver. Open to other concrete means of making actual measurable CO2, CH4, etc. emissions.